Monday-Thursday, 9 a.m. – 9 p.m.
Friday and Saturday, 9 a.m. – 6 p.m. 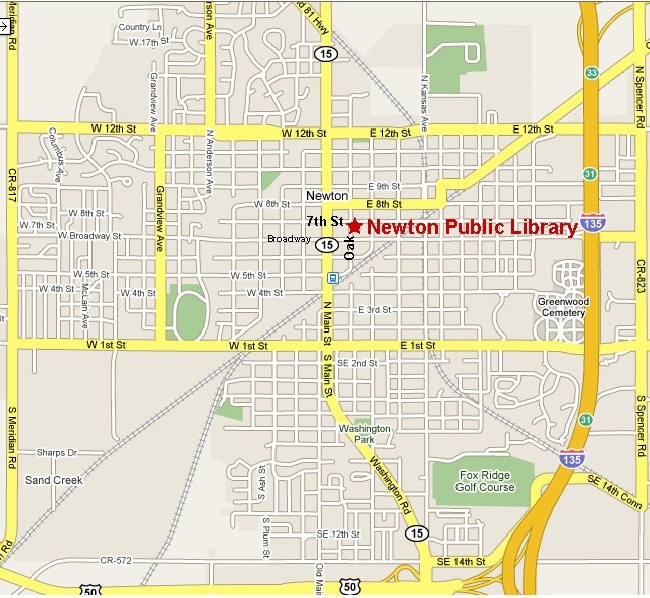 The Newton Public Library is located in Newton, Kansas at 720 North Oak Street, in Military Park between Broadway and 7th Streets. From I-135 take the First/Broadway Street exit to the Broadway roundabout, turn West on Broadway to the first traffic light (Oak and Main), then right on Oak Street. The Library is on the right in that block. The entrance is on the west side of the Library. Short term street parking is available on Oak Street or long term parking is available in the Oak/7th Streets parking lot.